Igor Salazar is vice president of South America for Hunt Oil Company. He joined Hunt in 2002 for the development of Camisea projects as commercial manager of PERU LNG. In 2011, he was promoted to general manager, and later was country manager in Peru. 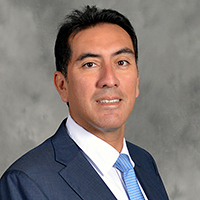 Salazar began his professional career in Peru with Petroperú and Repsol, in refining activities including planning, commercialization and operations. He continued in commercial activities at Texas Petroleum Company (Texaco), and later joined Endesa International in Chile, where he was involved in gas and energy commercial activities and business development in Latin America. He graduated as an industrial engineer at the University of Lima. He earned a master's degree in energy economics at the University of Oklahoma and has also taken the Senior Management Program (PAD) with University of Piura.